Summary: Birkhouse Moor is the high ground immediately to the west of Glenridding village. Its summit area is broad and fairly flat with areas of wet ground. 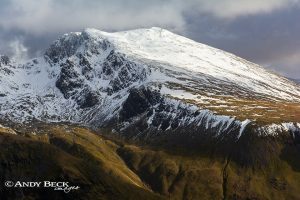 It is a fell which is often crossed by walkers as the first high fell in a round from Glenridding that will then take in Striding Edge, Helvellyn, Swirral Edge and then Catstye Cam before returning to the village. 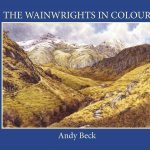 Wainwright had listed this fell for inclusion on his first and second lists and of course he gives it a chapter in the first Pictorial Guide- The Eastern Fells. On his 1 inch maps both O.S. and Bartolomew, the summit had not been given a marked height so going by the contours he estimated the height as 2350′, this is slightly puzzling as on the 6 inch O.S. map which he referred to in his work there is a benchmark near the wall at the highest point of 2353′ which would have been more accurate. The nearest measured height to the summit on his 1 inch maps was some 500 yards to the north-east at a height of 2318′, quite a bit lower than the summit itself. Even today some less knowledgeable walkers class this lower point with its decent sized cairn (and admittedly better views) as the “Wainwright” summit. When AW was working on this first volume of the Pictorial Guides he was developing his style and design and in the case of Birkhouse Moor he marks the highest point with a title and a small cross. This is very unusual (only happening on four other fells that I have found) as in other chapters he marks the summit cairn with a black triangle. For the energetic the north-east ridge provides the best ascent and is the quieter route to the top, it leads to the lower cairn. Topographical details: Wainwright’s estimated height of the fell at 2350′ has now been accurately calculated as 2356′ 718m. 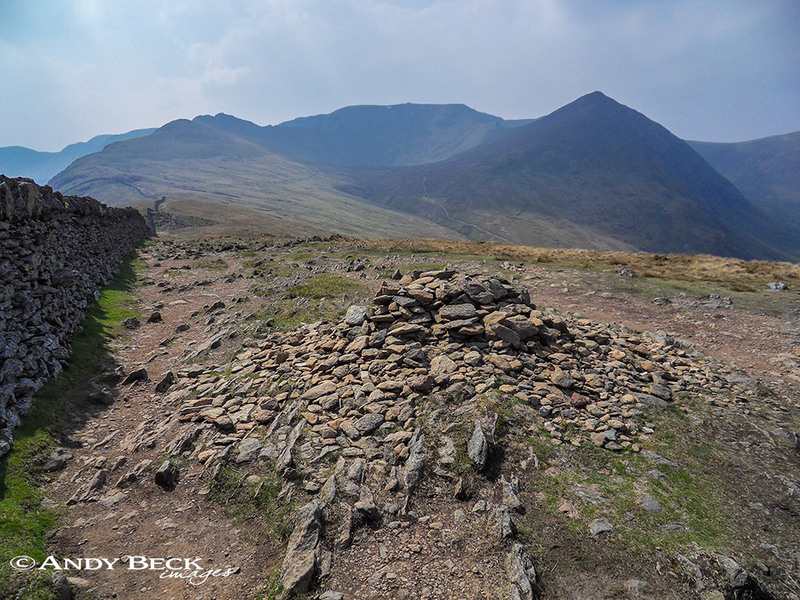 GR: NY36342 15975 it is marked by a low rough cairn shown below which is Wainwright’s summit. Points of interest: There are a couple of old round sheep folds at the top of Little Cove which are worth a visit as they make good foreground subjects for photographs. The summit has a reasonable all round view but the lower cairn has a better aspect of Ullswater. If time allows it is worth visiting the nearby height of Keldas which is actually private ground but with permissive paths to its top from where there are good views of Glenridding and Ullswater through some mature Scots Pines. It is interesting to note that even though on todays maps Keldas is marked where Wainwright showed it, to the east of Lanty’s Tarn it hasn’t always been so, on older maps of various scale the hillock was not named, only on the 1900 edition of the 6 inch map is there a Keldas Plantation but this was marked well to the west of the tarn. Perhaps this was an error on Wainwright’s part and the detail has now been adopted by the O.S. I would be interested to hear if anyone knows more on this. Nearest Facilities: Car parking in Glenridding there is a pay and display car park and limited time free parking. Pubs, tearooms, shops, food and accomodation all available in Glenridding. Tarns: Small unnamed tarns between the summit and the lower cairn. Lanty’s Tarn near Keldas. 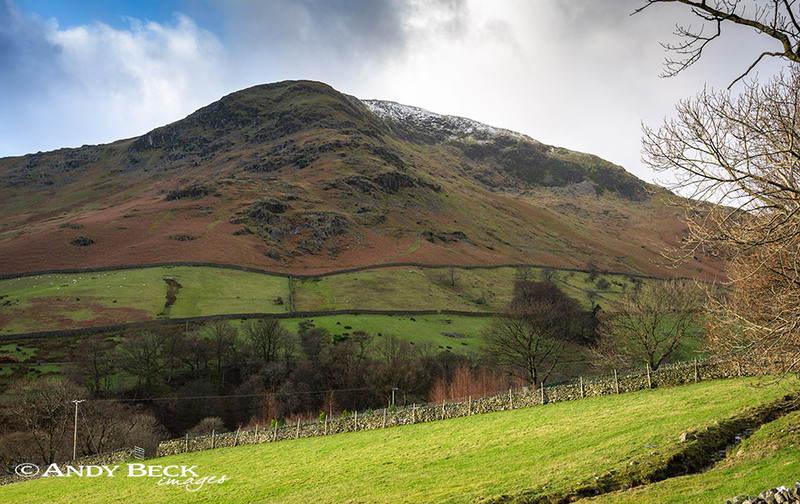 Star rating: (2.4 / 5) A good location close to Glenridding, an interesting ascent route up the north-east ridge, good views of Ullswater and the bonus of Keldas earns Birkhouse Moor this rating.